I'm continuing my Star Hue series with white this month. Well, some may argue that white isn't really a "color" but I personally see it as one, and a very timeless, important one, too! When Julia Engel from Gal Meets Glam launched her collection of beautiful dresses, I was first in line to shop! There were so many pretty pieces to pick from but I knew I had to be a good girl and limit myself to buying just one for now (which was really hard, by the way). In the end, I decided on this fit and flare dress with pearl details around the sleeves and neckline, which is available at Nordstrom. The second I put it on, I felt like a modern-day princess! The material is so comfortable and soft, and I love the fit. I think this dress is very versatile, too. I plan to pack it with me on my Europe trip and wear sneakers or slides with it. If you're a bride-to-be, this is the perfect dress for your rehearsal dinner or bridal shower! Also in a fit-and-flare silhouette, this cotton dress is designed in San Francisco by Cuyana's team and made in Turkey. I love the details on this dress: the balloon sleeves, the cinched-waist design, and the two front pockets! I've already worn this dress in multiple cities and styled it in different ways already. The airy material makes it a great piece for the upcoming warmer days despite the 3/4 sleeves. In fact, I think it works great as a great swimwear cover-up, too! Note: I received this dress as a gift from Cuyana; all opinions are 100% my own. For chillier days, simply throw a denim jacket over the dress. Since plain white t-shirts can sometimes be too plain, I like wearing pieces with a subtle twist. This top from Tobi, for example, has a tie-front detail. You can wear this almost with anything, so to me, it's considered a staple piece. Check out similar pieces here, here and here. 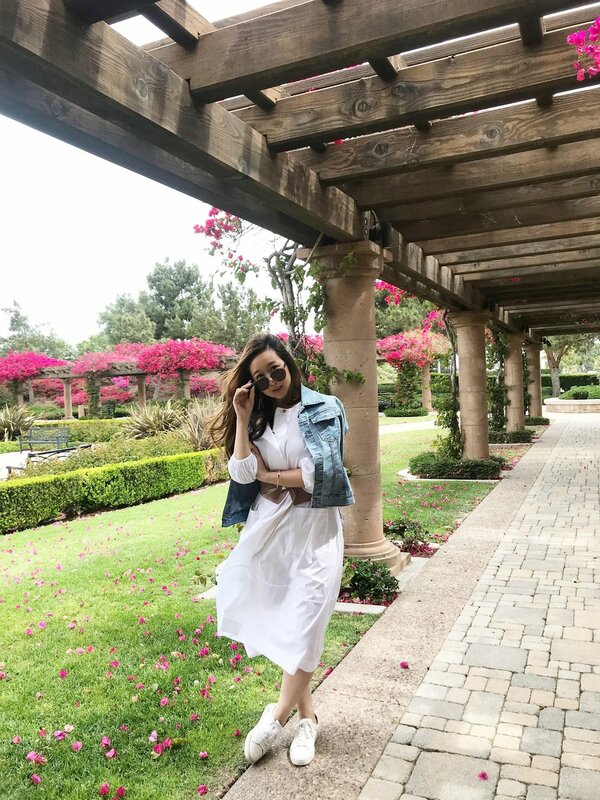 If you haven't already, check out my style post featuring a creamy silk robe I got from Maggie Wu Studio. The brand was founded by a good friend of mine, Maggie, who is also the brand's chief designer. She gifted me the robe from her latest silk collection (launching soon) and I loved it so much, I decided to style it in 7 different looks! The piece is soft to touch and made with great quality. The silk collection includes a maxi dress, cropped top and a midi skirt, and more. You can sign up to her newsletter for early access and shop the collection as soon as it launches! I love monochrome outfits because you can never go wrong with the matching! It saves a lot of styling time and it tends to always look so chic. Everlane recently launched a cheeky straight ankle-length jean collection and I purchased a pair right away! I love it for so many reasons: the fit is so flattering, and because I have shorter legs, the ankle length works perfectly for me!